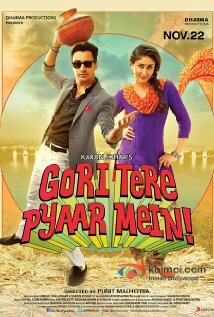 Gori Tere Pyaar Mein (“My Fair Lady, In Your Love”) should be a lighthearted rom-com, but it winds up being a depressing slog, thanks to a loathsome lead character. Imran Khan plays Sriram, the pampered son of a real estate developer. Sriram’s lazy, selfish ways once cost him the love of his life, and now he’s prepared to marry another woman just to stop his family’s nagging. He ignores the new woman’s pleas to call off the wedding so that she can marry the man she really loves. Sriram figures that’s her problem to solve, not his. The first half of the movie is essentially Sriram recounting his failed romance to his wife-to-be, Vasudha (Shraddha Kapoor), via flashbacks. This gimmick is unnecessary, and it actually serves to make Sriram look like an even bigger jerk than he already is. It demonstrates that he learned nothing from his earlier relationship with compulsive do-gooder Dia (Kareena Kapoor). Dia and Sriram initially fall in love because he’s impressed with her moxie. She’s willing to challenge power, an intriguing quality to someone like Sriram, whose only life goal is to convince his father to buy him an expensive car. Sriram — who has nothing better to do — follows Dia around on her charitable jaunts. Dia mistakenly assumes that this is evidence of either Sriram’s interest in her or her causes. The relationship ends when Sriram sabotages one of Dia’s pet causes for his own gain. He then unloads upon Dia one of the meanest speeches I’ve ever heard in a movie, elaborating the many ways in which he finds her to be a hypocrite. It’s hard to watch, and even harder to imagine that she would take him back after such a berating. But this is a movie, so we know that she will. As much as I like Imran Khan, it’s impossible to make a character like Sriram likable. There aren’t enough dance numbers in the world to achieve this feat, though goodness knows writer-director Punit Malhotra tries. Gori Tere Pyaar Mein is at least thirty minutes too long, due in equal parts to the pointless marriage subplot and too many dance numbers. Sriram is unapologetically selfish for over two hours of the movie’s 150-minute runtime, so his obligatory moral growth comes too late to be truly redemptive. Further undermining the effort to make Sriram seem like a good guy is how he goes about proving that he finally cares about someone other than himself. He does so by holding a knife to the throat of his adversary’s 18-year-old son, forcing the adversary to concede defeat. Yep, Sriram gets his redemption via extortion and the attempted murder of an innocent kid. What a guy. Dia’s only flaw is that she has anything to do with Sriram in the first place. Kapoor does a nice job portraying a confident, compassionate heroine we can root for. I wish this movie had been about her triumph, and that none of it depended on Sriram. This entry was posted in Reviews and tagged 2013, Bollywood, Gori Tere Pyaar Mein, Hindi, Imran Khan, Indian, Kareena Kapoor, Movie Review on November 22, 2013 by Kathy. Hi Kathy, Will you post the review of the Sunny Deol movie? Hi, Nav. I’m going to see it on Monday. Hi Kathy, have you seen ‘Ghayal’ and ‘Damini’ starring Sunny Deol? Those are must see movies of his. This guy is a tremendous acting talent, but nowadays the script and direction is poor. Wouldn’t it be great to see Sunny as a teenager’s cool dad, or maybe in a role like Liam Neeson’s in Taken? Yes, but the opportunity needs to be there. But you should definitely watch his movies Ghayal, Damini and Arjun too. Those are g8 movies of his.